Few things are more important to us then photo’s of our kids, relatives and events. I can remember several times where I got phone calls from people in tears because their photos were lost. One of the most remember able times was women who just lost her teenage son. He had hundreds of photo’s of him and his friends but just before his tragic death he formatted his computer and deleted by accident or on purpose all the photo’s on his computer. In this case I was able to recover most if not all the photo’s on his computer. The same story goes for a crashed hard drive with baby photo’s, a computer with wedding photo’s and so many others. I remember these data recovery jobs the most because I really felt for the individual and was bound and determined to save all I could. In all the above cases I used Recover My Files to recover all the deleted data on the drives. This all in one recovery program is one of the easiest for end users to use and offers the most data recovery options. If you formatted your hard drive it can recover all those files, if you loaded up a new operating system it can recover your photo’s from that operation. Same goes for simply permanently deleting your files and from a partition becoming corrupt. What makes this program so good is that it does not just do one type of recovery but does several different types so it should work well for you regardless of the cause of data loss. It does not repair bad hard drive sectors. Over time your hard drive will start to die off. In most instances this is detected and the data moved from that location and it’s blocked off so new data is not written there. If dozens of sectors fail at once this can cause your drive to no longer work as many of the sectors are no longer readable. In rarer instances like this I use HDD Regenerator first and then run Recover My Files on the drive to pull the most data possible. As stated this is only needed when the drive is mechanically failing. If your drive is knocking and making weird sounds then running the HDD regenerator tool is a good idea. Step 1. Stop using the hard drive that has the photo’s on it. You do not want to risk that data being over written. What you need to do is turn off the computer and remove the hard drive that has the files that need to be recovered. Remove the hard drive and install it as a secondary drive on another computer. See our Installing a Secondary Drive guide to learn more on how this is done. You may Also want to learn how to remove a hard drive. If you are in need of equipment to easily install or mount the secondary drive you can check out our Data recovery Equipment list. Step 2. Install your data recovery software on the computer that the old hard drive (The drive that has the missing or deleted photos on). In this case to recover photo’s we recommend you use Recover My Files as it will get you your best results. Step 3. 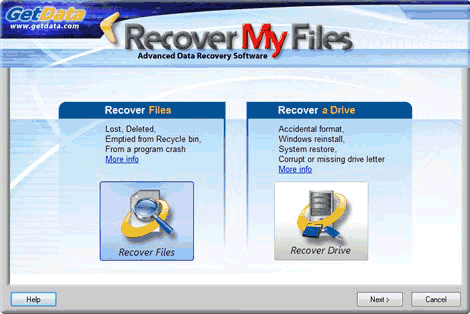 Run the Recover MY Files program and select the best option that pertains to your situation. It will either be “Recover Files” or “Recover A Drive”. If you selected the “Recover A Drive” option you will now need to select the drive you want to run the recovery program on and hit next. From there you will need to select a few file types to build the image around. I recommend you select no more then 3 file types. doing .doc, .jpeg and .avi for instance from the list. If you run the “Recover Files” option and hit next it will automatically go out and detect deleted files and recover those files for you. After that it can perform a deeper scan called “Lost Files” and recover all deleted files on your PC for you. In the case of lost files the names of those files will of changed but the image or what is left of the image will be recovered. You should expect a few images to have lines in them if portions of those files were already over written. Once your photo’s have been recovered you can copy them to a location on your computer. Do not save data onto the same hard drive that you are recovering from. You do not want to accidentally over ride the data on that drive. For a full list of photo recovery software you can check out our photo recovery software reviews section. However the Recover My Files is the best program to use as I have had the best overall results with it.